The Ridgeway is a very centrally located two bedroom, two-storey Victorian apartment, with spacious rooms, a private parking space and stunning panoramic views over Keswick towards Catbells and the fells beyond. It is situated on a quiet no through road close to the Market Square and Fitz Park and an easy stroll to Lake Derwentwater and Theatre by The Lake. Enjoy al fresco dining from the south facing patio or gaze at the fells from the first floor lounge with bay window and cosy open fire. There is a useful ground floor utility room for bikes and walking gear. Now with wi-fi, fully enclosed patio and towels included. The Ridgeway is a beautiful Victorian property, with many personal touches to create a ’home from home’ feel and ideal for those wishing to be close to all local amenities but just out of the way of traffic and crowds. The fully enclosed south facing patio has wonderful views to the fells for perfect al fresco dining. Private parking is allocated opposite for one car. The large, bright lounge with high ceilings on the first floor has a fabulous bay window looking out over Keswick to Catbells and the fells beyond. There are two large sofas and an open fire for cosy winter nights, with dining table in the picture postcard bay window. There is a flat-screen TV, DVD and games console with blue-tooth DAB Radio / CD player and plenty of Lakeland guides. The twin bedroom with new oak furniture (chest of drawers and wardrobe) and DAB radio is also on the first floor with lovely views towards Latrigg. This room can be converted to a King-size bed upon request for a small charge. The newly refurbished first floor bathroom is fully tiled and has a double ended bath, separate shower cubicle, towel rail and wash hand basin. There is a separate WC on this floor. On the ground floor there is a bright double bedroom with a bay window overlooking the patio/garden. There is a double bed, with plenty of storage, a flat screen TV/DVD, hairdryer and lovely high ceilings. The very modern kitchen is also on the ground floor with newly fitted units, granite worktops, built in electric oven and gas hob, microwave, dishwasher, fridge, freezer, washer/dryer and breakfast bar, with well stocked cupboards with everything you would need on a self-catering holiday. There is a sizeable utility room at the back of the apartment for walking gear and bikes, providing rear access to the street. The downstairs shower room has a shower, WC and wash hand basin. Please note that a bath sheet, two bath towels and a hand towel are now provided for each bedroom. Skiddaw Skies is a three bedroom apartment built of local slate with spacious rooms and a private roof terrace. It stands in an elevated position with fantastic sweeping panoramic views across Keswick towards Catbells and the north western fells from the front and Latrigg and Skiddaw from the rear. Centrally located in a quiet road with no through traffic yet very close to the town centre and Fitz Park, this property benefits from a private parking space and easy access to local amenities. A leisure pass is included, granting free entry for 4 people to Keswick Leisure Pool and Fitness Centre. Now with a new third bedroom loft conversion but also available to book as a two or one bedroom reduced occupancy option. Skiddaw Skies is situated in a quiet no through road in the heart of Keswick, an ideal location for easy access to local amenities, Fitz Park and the beautiful Lake Derwentwater, yet tucked away from any passing traffic or passers-by. This recently renovated apartment is the upper floors of a lovely Victorian property, accessed by a flight of steps, and its elevated position provides fabulous panoramic views across the fells from all windows. There is a superb roof terrace which is the perfect place to sit and take in the wonderful scenery over a sunny breakfast or on summer evenings. A private parking space for one car is allocated just opposite the property. The lounge is spacious, light and comfortable, with two settees, dining table and chairs, flat-screen TV, CD player and large windows looking across Keswick towards Catbells and the north western fells. This room has an open fire for cosy winter evenings and books and maps on the local area are provided. The modern fitted kitchen is situated next to the lounge and is well equipped with an electric oven, gas hob, dishwasher, washer/dryer, fridge, freezer, microwave and a breakfast bar with great Latrigg views. The luxurious main bathroom is fitted to a high standard, with a large shower, roll-top bath, wash basin and WC. On the middle floor, there are two adjacent bedrooms. The large double bedroom has oak furniture providing plenty of storage space, a flat-screen TV and a super-king sized bed from which the fantastic fell views can be admired. This room has an ensuite bathroom with a shower, wash basin and WC. 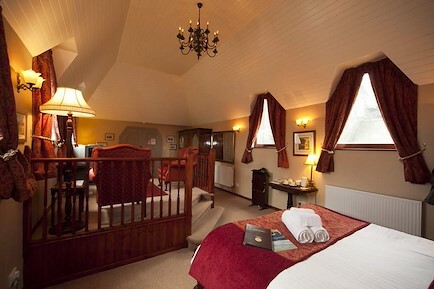 The second bedroom has twin beds, oak furniture and views towards Skiddaw. The top loft floor of Skiddaw Skies has been recently converted to a third bedroom with twin beds, oak furniture and ensuite WC with basin. The two large velux windows on either side of this room provide amazing views of both Skiddaw and the north western fells. Towels are provided for this property, with a bath sheet, two bath towels and a hand towel per bedroom. A travel cot and high chair are also available if needed. Your enquiry will be sent directly to The Ridgeway and Skiddaw Skies. Please fill in as much detail as you can.